MIDDAS have been awarded a major healthcare project at the BUPA Cromwell Hospital for an new Adult Intensive Care Unit (AICU) by Howorth Air Technology, BUPAs delivery partner for this prestigious project. 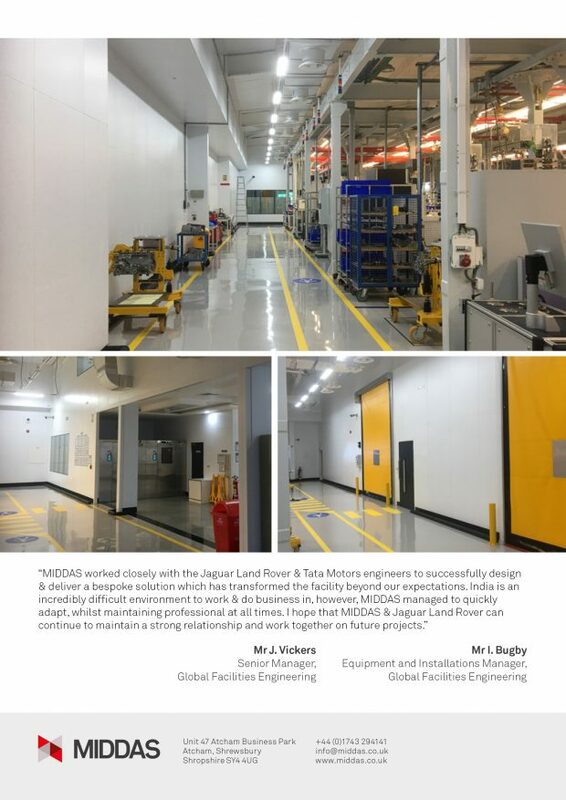 The project required a modular partition solution with excellent acoustic performance and fire rating (60 minutes integrity and insulation) which is backed by MIDDAS’s extensive test data. 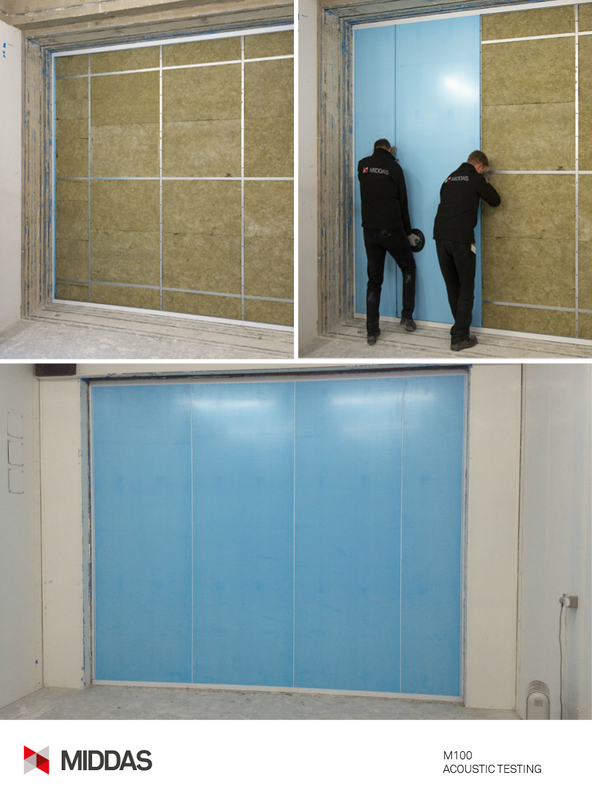 Development and testing of the MIDDAS flagship, M100 bi-panel system continues at a relentless pace with the latest focus being sound insulation performance. 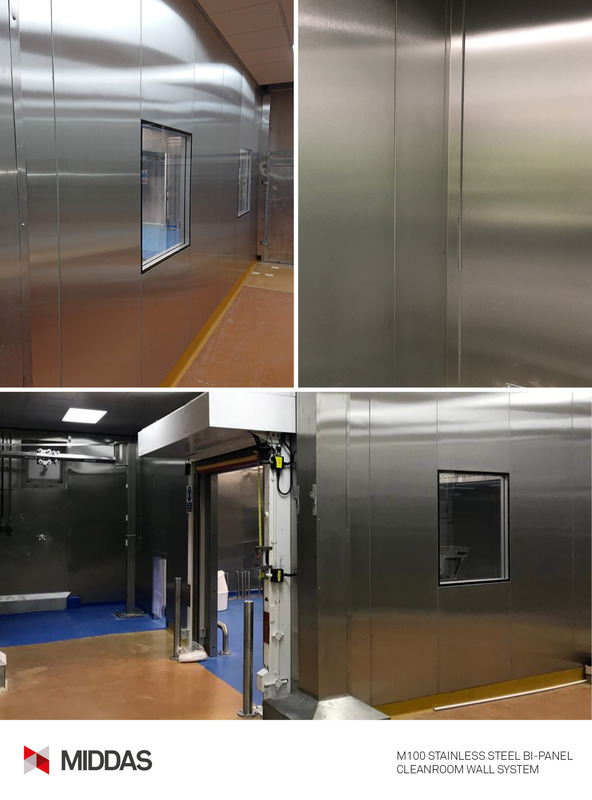 At MIDDAS we now offer our M100 bi-panel cleanroom wall system in Stainless Steel for those projects that require a specialist finish. MIDDAS product development has been rewarded with a major new project win for a confidential client processing semiconductors. 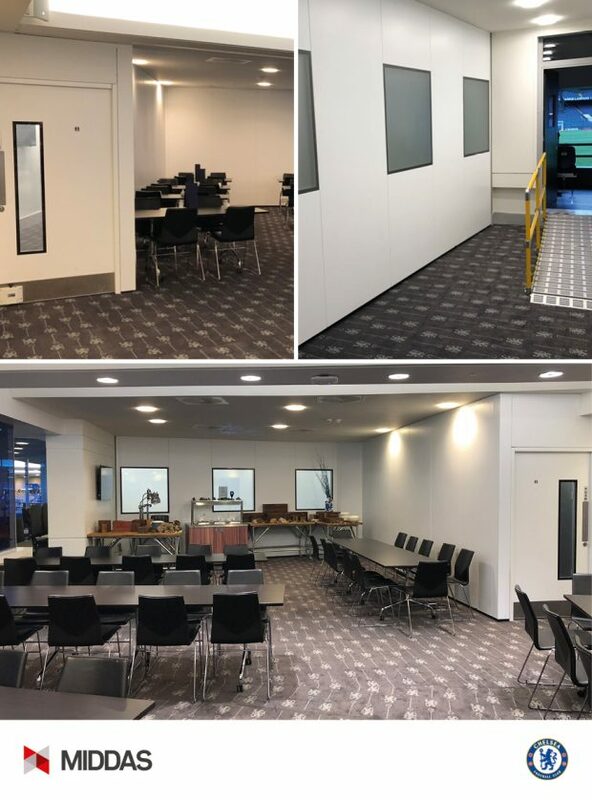 The proven M100 partition system is now offered as a single sided side post and panel system with aluminium core, which has been specifically developed for the semiconductor market. 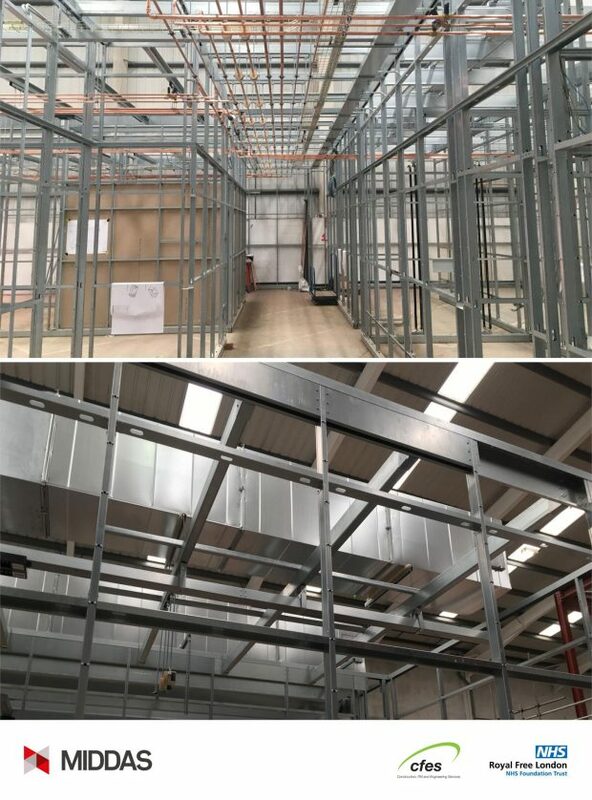 It’s great to see the MIDDAS structural frame work supporting the distributed services for the new Royal Free Hospital NHS Trust CSSD facility. 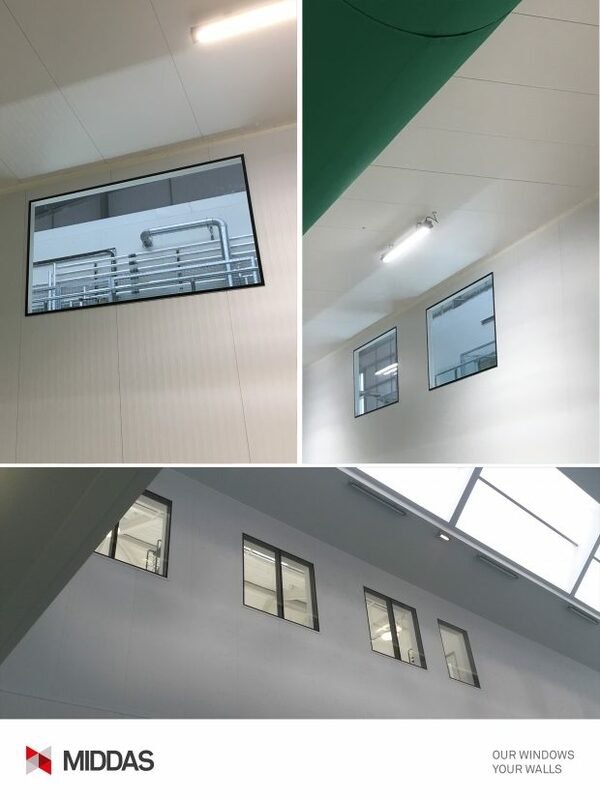 MIDDAS have developed the proven M100 wall system to include structural beams offering free-standing facilities for offices through to complex cleanrooms, laboratories and advanced manufacturing facilities. It’s the detail that counts. 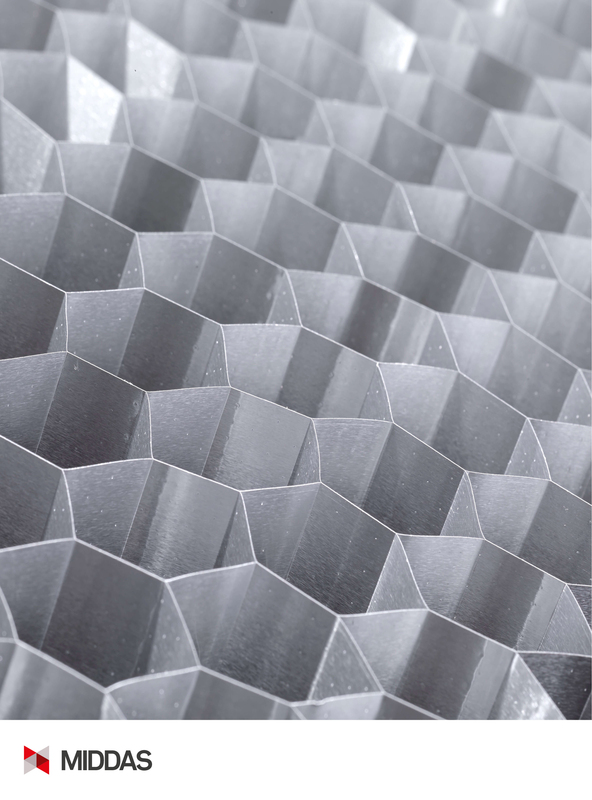 As a UK designer & manufacturer we add those finishing touches and practical solutions to our walling systems. 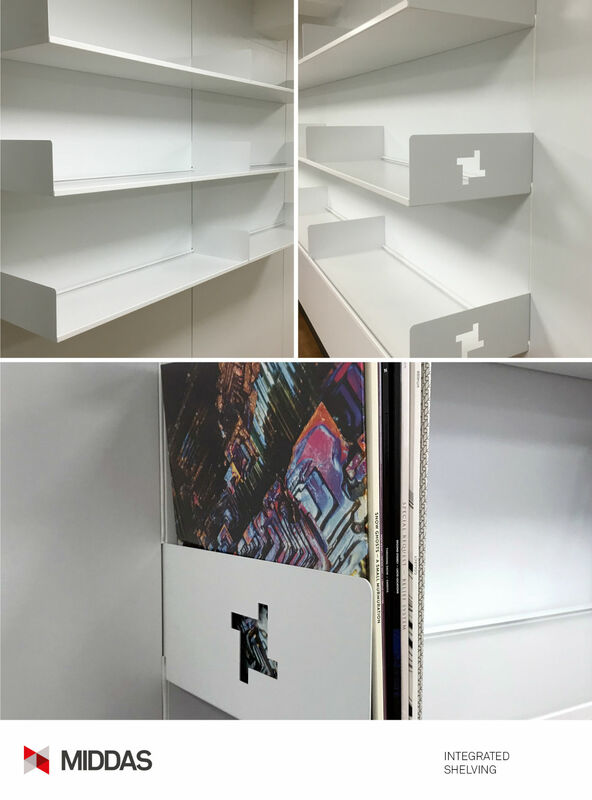 This bespoke shelving is fully integrated and supported from our wall system and was designed for a prestigious collection of rare vinyl records for the famous fabric nightclub and record label’s offices. MIDDAS offsite manufacture has more than programme benefits. The advantage of offsite manufacture can be seen by the speed the MIDDAS structural frame has been installed. All components arrive at site, clearly identified and ready to install. We even punch all fixing holes which makes installation a simple assembly process, significantly reducing site construction activity. 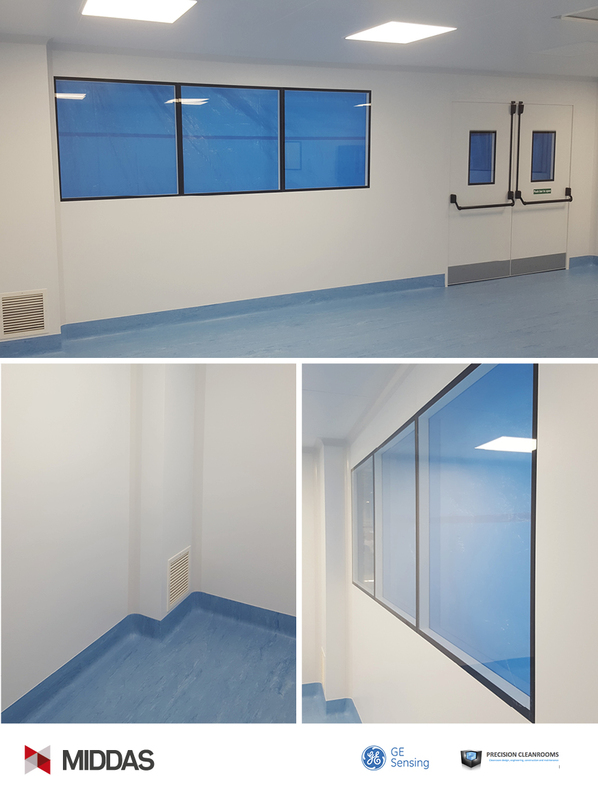 Another good week at MIDDAS – we’ve just started a new project at GSK Barnard Castle. 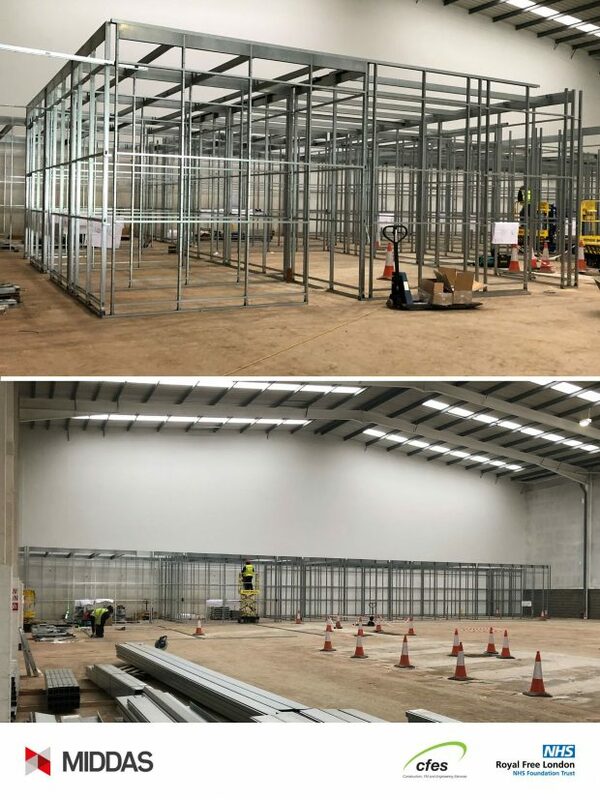 Not a cleanroom, but half-glazed freestanding partitions to manage both people and product flow around a process line. 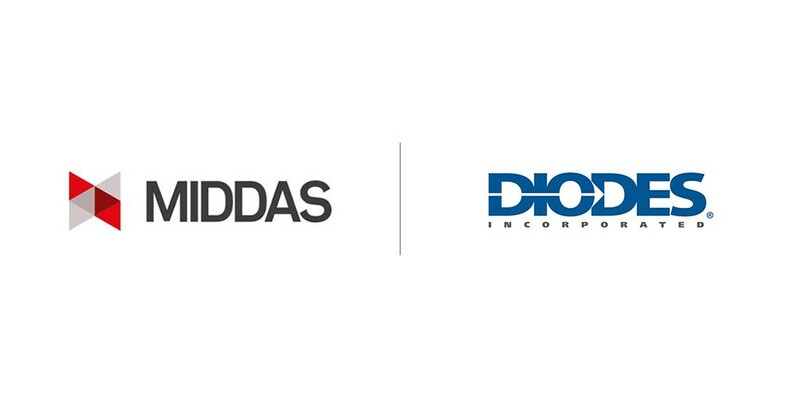 A key feature of the MIDDAS solution is the integration of Dortek doors, again not standard solutions. 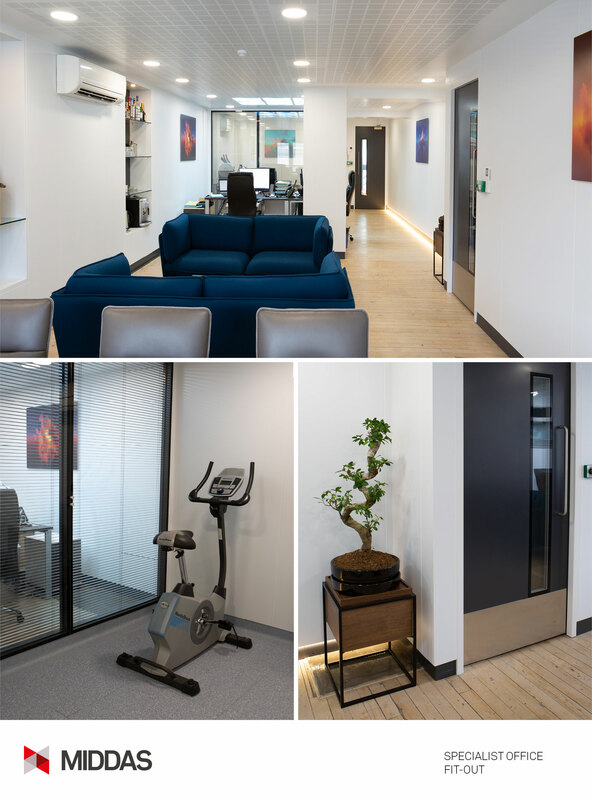 MIDDAS and Dortek have worked closely with the GSK team and Interserve to optimise space and functionality of the area. The new scheme includes the latest Dortek horizontal rapid roller doors, telescopic sliding doors as well as standard hinged arrangements. 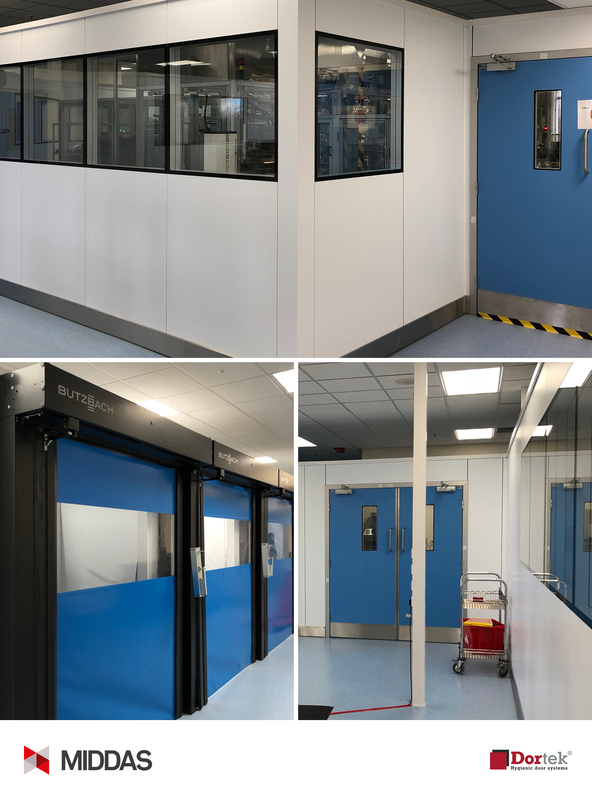 Precision Cleanrooms have recently selected and installed MIDDAS wall panels, flush glazed screens and door sets for a prestigious cleanroom build in Ireland. MIDDAS manufactured the M65 panels to size ready for installation, significantly reducing site construction activity.